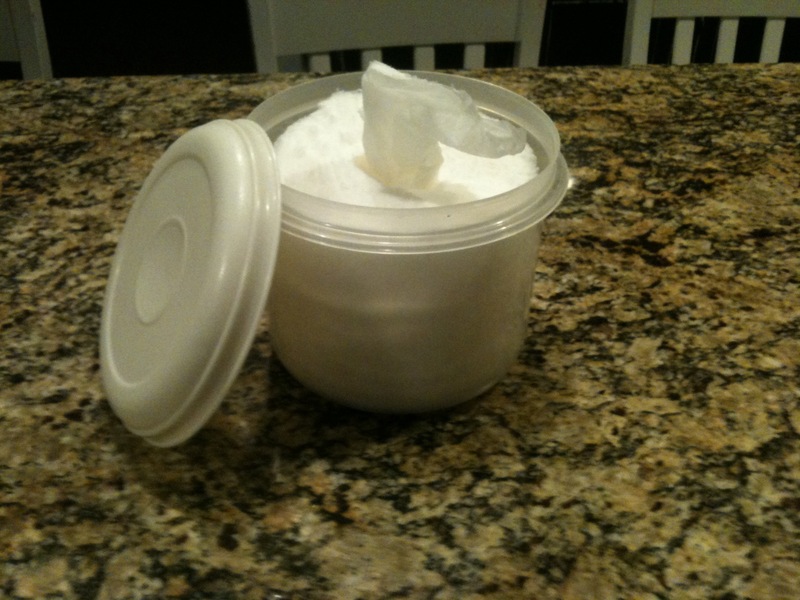 Back when my girls were all in diapers, some wonderful soul introduced me to home made baby wipes. They were fabulous and a major budget-saver. Well, we’ve been diaper-free around here for nearly 3 years but I held on to that wonderful Rubbermaid bowl and lid because I knew it would come in handy again someday. I have been making my own granite cleaner for about a year and half and just keep it in a spray bottle. However, one of my goals for school and life this year is to hand off as much of the house keeping as I possibly can to the girls and when it comes to cleaning, they can get a little trigger-happy and use a lot more of a spray than necessary. Enter the home made granite cleaning wipe! First you have to find a lidded container that will hold the equivalent of half a roll of paper towels and about 3 cups of liquid. This can be the hardest part. Mine is a round, 10 cup Rubbermaid container, but use whatever works for you. After that, take a large roll of paper towels and cut in half width-wise with a very sharp knife (you will end up with what looks like two giant rolls of toilet paper). Be careful, the only stitches I’ve ever had came from doing this back in my baby wipe-making days. Pull the cardboard core out of each half. Put one half away for your next batch of wipes. Set the half-roll of paper towels in the liquid. Press lid on and allow to absorb for a few hours. Both projects are super-simple and work great. Enjoy! I was telling Rex last night that I could not believe I forgot about homemade baby wipes, and he got this *very* strange look on his face. 🙂 I asked him what was wrong and he said he was so bummed that I remembered.. apparently he HATES homemade baby wipes. ha! I had no idea. I asked him if his hate was so strong that I shouldn’t make them for the money savings? He said no. So thanks! (from me!) I am glad you jogged my memory. 🙂 I still own my container too. I look forward to having granite counters someday to use that recipe too! I’ve wanted to try this for a while now…is there a certain brand of paper towels you recommend for the best quality (least likely to rip) wipe? Jenna, I haven’t bought any for a long time; I just happened to have a couple of extra rolls in the basement. I know the wipes recipe recommended the Bounty Big Roll, but I think I actually bought the Member’s Mark pack at Sam’s. The roll isn’t quite as large as the Bounty Big Roll, but still larger than most and they’re good, quality paper towels. Have fun!